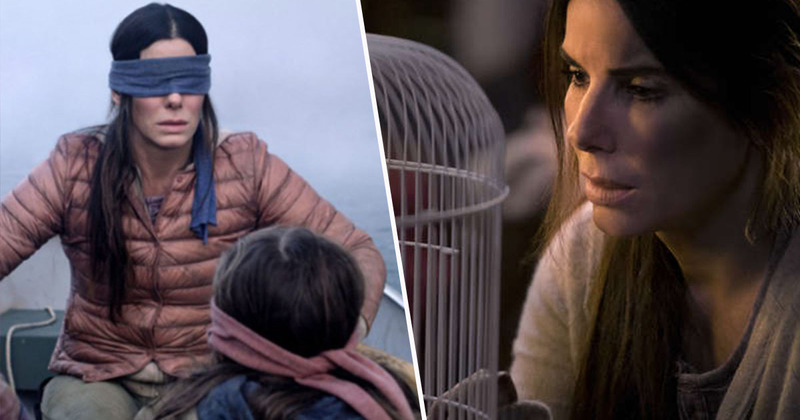 In the two short weeks since its release, Bird Box has seemingly captured the imaginations of more Netflix viewers than any of the streaming service’s original films before it. You know a film is successful when ‘challenges’ and ‘memes’ relating to it start going viral – especially so early on. And although the film hasn’t garnered entirely positive reviews across the board, it reportedly received more than 45 million views in its first seven days – more than any other Netflix original film. The film is based on the 2014 novel of the same name by Josh Malerman. It follows a pregnant Malorie (Sandra Bullock), as she joins a band of survivors, along with her child – and one other person’s child – in an attempt to escape an unknown force which is causing mass suicide. However, the ending of the new film differs from the ending of the 2014 novel, and proved to be a surprising twist for those already familiar with the book. In the film version, Malorie and the two children finally make it to the sanctuary, which is a seemingly happy, safe place from the dangerous force. The sanctuary turns out to be a school for people who are blind, and have therefore avoided the horrors of the outside world. However, this relatively uplifting ending was not the case in Malerman’s novel. In the book’s original ending, the sanctuary Malorie and the children come across is a group of people who have intentionally blinded themselves, in order to avoid the evil forces. A much darker and pessimistic ending, I’m sure you’ll agree. [But] it seemed smarter for us to make that more of an optimistic ending. I’m one who generally leans toward a hopeful or optimistic ending even in dystopian horror movies. I’m not one to embrace nihilism considering that I feel like we’re living in that world now. Heisserer – who was nominated for an Oscar for 2016’s Arrival, which he adapted from a short story by Ted Chiang – had been working on drafts of Bird Box for about four years, and even read the novel before it was published in 2014. He also suggests, for those comparing Bird Box to A Quiet Place, the latter could’ve easily been inspired by Malerman’s novel too, rather than the other way around. Heisserer also revealed, despite Sandra Bullock describing what the evil creatures really looked like, he never settled on a definitive form for them. For many drafts, the creatures did have a weight and a certain shape or form. But [for] what they looked like we never really went into detail. Keeping the supernatural forces unseen in the film is the same as the book then, unlike it’s ultimate, dark ending.